The act of sending is spoken of repeatedly in our Lord’s Trinitarian Discourse in the Upper Room just prior to his arrest and crucifixion. Christ was sent to save those whom have been given to him by the Father, i.e. the elect covenant people of God. …highly exalted him and bestowed on him the name that is above every name, so that at the name of Jesus every knee should bow, in heaven and on earth and under the earth, and every tongue confess that Jesus Christ is Lord, to the glory of God the Father. Thus, Daniel reveals God the Father as saving his elect people through the sending of his Angel, his Son, who descends into the fire and pit of judgment. The book also reveals the Father as rewarding the Son of Man, i.e. the Son, with glory and honor and dominion, as Paul reveals in his epistle to the Philippians and, likewise, in 1st Cor 15:22-28. As has already been touched upon above, Daniel reveals the Son of God as descending from heaven to save God’s people. The prophet also reveals the Son of Man, upon finishing his salvific work, as ascending to heaven to receive his kingdom from God the Father. Thus, the Son of God is also the Son of Man, the Angel of the Lord who shares equally the divinity of the Father and the humanity of those who will occupy his eternal kingdom. That the Holy Spirit, through the prophet’s writing, intends to present Christ in his two natures as Divine and Human, moreover, is evident when consideration is given to the pattern of descending to save and ascending to receive glory from the Father found repeatedly in the NT. That will was to die, to suffer for God’s elect people in order to redeem them from the fires of hell, and the pit of eternal destruction. finish transgression, put an end to sin, atone for iniquity, bring in everlasting righteousness, seal both the vision and prophet, and anoint a most holy place. …the righteousness based on faith says, “Do not say in your heart, ‘Who will ascend into heaven?’” (that is, to bring Christ down) “or ‘Who will descend into the abyss?’” (that is, to bring Christ up from the dead). But what does it say? “The word is near you, in your mouth and in your heart” (that is, the word of faith that we proclaim); because, if you confess with your mouth that Jesus is Lord and believe in your heart that God raised him from the dead, you will be saved. Christ is the Son of God who “was manifested in the flesh,” Paul says elsewhere, and “taken up in glory.” Once again, he repeats the descending to save/ascending to receive glory that is present in the book of Daniel. Daniel does not make much mention of the Holy Spirit, but what he does mention is significant. Translations, perhaps under the assumption that pagans would not speak of the Spirit of the Holy God typically translate the Hebrew phrase as “the spirit of the holy gods.” Thus, the phrase, appearing in Dan 4:8, 9, 18 & 5:11, is understood to be a reference to the spirit (sing.) of the pagan deities (pl. ), and not the Holy Spirit. Given that those who are speaking this way of Daniel are pagans, it seems likely that they were looking at Daniel through their overriding religious presupposition (viz. polytheism). Yahweh had already been identified as absolutely distinct from all of the other deities for being “a revealer of mysteries.” He now is identified as absolutely distinct for his unique ability to save rescue his people. Consequently, given that the Lord is recognized as being unique among the gods (i.e. as holy) for his ability to reveal mysteries and exercise Sovereign control over creation, it seems much more likely that the phrase “spirit of the holy gods” is incorrect. Grammatically, such a translation is possible; however, the context of Daniel - in which holiness is solely ascribed to God, his angels, and his people - the Spirit of the Holy God is much more fitting. This, in conjunction with the aforementioned implicit Christology of the book of Daniel, then, reveals the Holy Spirit’s relationship to the Father and the Son. The Spirit of the Holy God takes up residence in Daniel, illuminating his understanding in general, granting him wisdom in general, revealing the person and work of the Son of God/Son of Man, as well as revealing the relationship between the Father (as sender of the Son) and the Son (as Savior, exalted King, and Judge). Not only this, but by means of the law of transitivity we can deduce the deity of the Spirit of God from the book of Daniel. 1. The God of heaven is the revealer of mysteries. 2. The revealer of mysteries is the Spirit of the Holy God. 3. Therefore, the Spirit of the Holy God is the God of heaven. 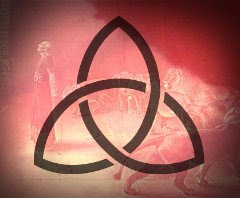 The book of Daniel contains a Proto-Trinitarianism whose exact details are later fleshed out by the Lord Jesus Christ in his Upper Room Discourse. In Daniel, God sends his Son/Angel to enter the fire of judgment and save the elect. He later rewards the Son of Man, who is equally divine, after the Son has fulfilled his role and ascended to the heavenly throne. The Son of God/Son of Man is fully God and fully Man, the Anointed One who comes down from heaven to save God’s people by entering into the fires of judgment and the stone-enclosed pit, and who ascends back to the throne of God to receive honor, glory, power, and majesty to the glory of him who sent him. These truths, finally, are revealed by the Spirit of the Holy God who indwells God’s elect (spec. Daniel), setting him apart from the world, gifting him with true wisdom and not the falsehoods of the world. For more on the Angel of the Lord see Burgos, Michael R. “The Proto-Trinitarianism of the Old Testament: Part 1,” Biblical Trinitarian, http://www.biblicaltrinitarian.com/2017/01/the-proto-trinitarianism-of-old.html, accessed 01/28/2017. cf. Isa 6:8, 42:1, 48:16; Zech 2:7-11; et al. cf. Ex 3:2; Num 20:16; Jud 2:1.
 cf. John 14:26; 15:26; 17:3, 8, 18, 20-23, & 25. Where is the one who is wise? Where is the scribe? Where is the debater of this age? Has not God made foolish the wisdom of the world? For since, in the wisdom of God, the world did not know God through wisdom, it pleased God through the folly of what we preach[b] to save those who believe. For Jews demand signs and Greeks seek wisdom, but we preach Christ crucified, a stumbling block to Jews and folly to Gentiles, but to those who are called, both Jews and Greeks, Christ the power of God and the wisdom of God. For the foolishness of God is wiser than men, and the weakness of God is stronger than men. Gill’s Exposition of the Entire Bible, Daniel 4:8. Angels: 4:13, 17 & 23. Saints: 7:18, 21, 22, 25 & 27.
 cf. Dan 7:13-14 & 6:25-26.